Take the Danshui (red) line, exit at Jian Tan station. Follow the signs to Ming Chuan University. 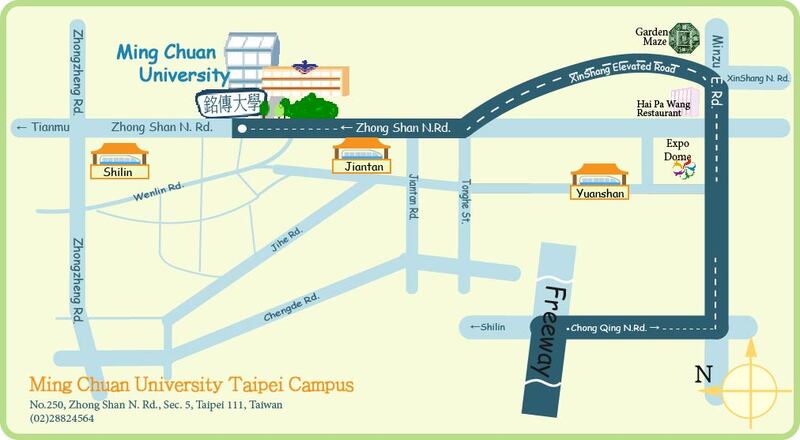 Kuanghua Bus (光華巴士)：Keelung－Shihlin (基隆－士林), Chungli－Shihlin(中壢－士林), get off at Jiantan MRT stop(劍潭捷運站). Take Chong Qing N.Rd. exit toward Shihlin. Once past Bailing Bridge, travel straight on Zhong Zheng Rd. Turn right on Zhong Shan (Chung Shan) N. Rd. Once past the fire station on the left, prepare to turn left into the campus driveway.